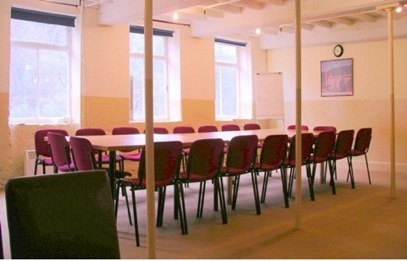 Located in the unique historic setting of the beautifully restored 1783 showpiece mills of Sir Richard Arkwright, and easily accessible on the A6 at Matlock Bath, Derbyshire, are the three light and airy conference and exhibition suites at Masson Mills. Go greener with your conference by holding it at Masson Mills - electricity used at Masson Mills is renewable and emits zero carbon to air emissions, as it is produced on-site by state of the art hydroelectric turbines powered by the River Derwent. This minimises the carbon footprint of all visitors to the site. 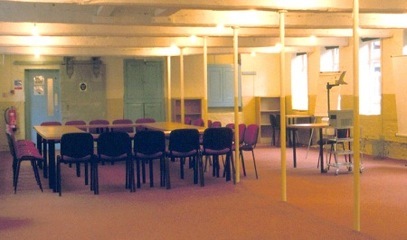 *The Main Suite and Archive Room are subject to a minimum charge of £75 + VAT per day or part of day. A half-day rate is available in Main Suite only at 70% of the day rate, subject to above minimum charge Day prices include hire of conference suite equipped with overhead projector, screen, flipchart and stand, water coolers and cordials, WiFi broadband and ample 13 amp sockets. Additional equipment may be hired at cost - please contact us for details. Please contact us for up-to-date menus and catering details as these are seasonally updated. Prices valid from January 2012. Early Morning/Evening conferences: For early morning conferences before 8 am and for evening conferences after 5pm, please note that a set charge of £25 + VAT for additional staffing costs will apply for bookings outside the normal hours of availability. The Main Conference Suite comprises 4,030 sq. ft. for up to 150 delegates. This area can be subdivided to allow maximum flexibility in seating arrangements, i.e. theatre, group classroom and lounge style. Incorporated within this suite is a separate lounge-style area for up to 60 delegates. Total occupancy 150 delegates. 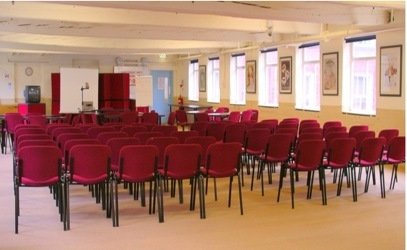 The Archive Room is a self-contained room for up to 40 delegates, with its own designated hot and cold drinks facility. The Boardroom is a self-contained room for up to 20 delegates, with its own designated hot and cold drinks facility. All suites are equipped with water coolers and cordials. Available for all delegates for the duration of the conference in the designated car park levels during weekdays. Delegates may choose from a wide range of meal options, freshly prepared in-house by the Edinburgh Woollen Mill Ltd. 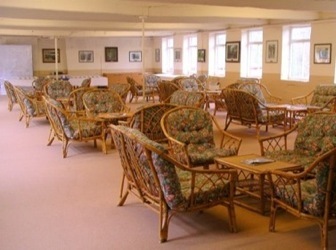 Exclusive lunchtime use of the Arkwright Tearoom is available for groups of 20+ who have pre-booked a buffet lunch. Delegates who book conferences on more than one consecutive day and who choose one of the following buffet options: Spinner’s Fare, Weaver’s Choice or Mill Owner’s Feast will be offered a variety in menus on consecutive days. Cold buffets only may be served in the Main, Boardroom or Archive Conference Room by prior arrangement. Option B - Self-service - A wide range of very reasonably priced hot and cold snacks and meals is available every day in Masson’s own licensed self-service Derwent Restaurant. Vouchers may be pre-booked at time of booking. Option C - No meal option - Delegates (especially those on a half-day basis) may take the opportunity to combine a half-day conference/exhibition with half a day of shopping and historic discovery in these fascinating, warm and beautifully restored historic buildings. There is no need to go outside, since the museum and shopping village and all the catering facilities are fully accessible from inside, with full disabled access. Delegates are invited to visit the fascinating Masson Mills Working Textile Museum, take a breath of fresh air, relax and enjoy the abundant wildlife by the River Derwent. A concessionary half-price museum entrance ticket is offered to all delegates and organisers, valid on the day of conference only. (Please note if a guided tour is booked a guide fee of £10 per group is applicable). Further details about the Working Textile Museum. Delegates may also enjoy browsing in Masson Mills Shopping Village. Every year Matlock Bath Parish Council holds a PRO LOCO competition, in which artists are invited to paint a scene of their choice within the parish. At the end of a set time the winner is chosen by public vote and the winning entry retained by the Parish Council and added to the collection on display in the Masson Mills Main Conference Suite. This fascinating collection consists of the original winning paintings, each one depicting a scene within the parish, for every year, in chronological order, from the inception of the competition up to the present day.